Mix all of the salad dressing ingredients well in a blender or food processor. Chill for at least two hours before serving. Assemble salad and toppings in a large bowl. Pour on desired amount of dressing and toss right before serving. Top with freshly grated parmesan cheese. 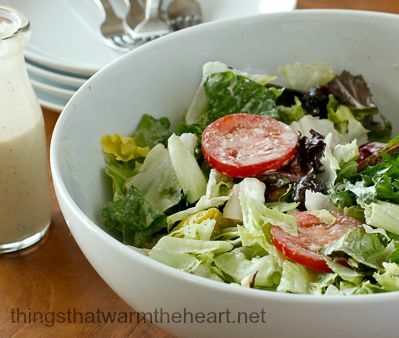 This makes enough dressing for about four large bowls of salad and will keep for up to a week in the refrigerator.